Well, as I’m sure you all know, last month a certain Royal couple tied the knot. We had a party round my friends flat (flags, British themed cakes, union jack napkins – the works!). Whether you were camped out days in advance (yes I do know people who were there) or caught up on the main details via the news (it was hard to miss it completely), it had a way of bring the country together. The British love a good Wedding and I have to say, we do Weddings well. It’s one of the few chances we get to dress up and make an effort. There’s always that panic of what to wear; trying to work out if any of the same people will be there, and so whether you can get away with wearing the same dress that you wore to the last one; and five minutes before you are due to leave, you can’t find on of your shoes…….. I remember one wedding I went to of a close friend where the fashion that year was for black and white – everyone was in every kind of black and white dress you can imagine. Now I have never suited black or white – I am one of those people that could go to Africa and stay exactly the same colour. I like to think of myself as an English rose, in reality I am just very white! That year I had found a beautiful emerald green dress the perfectly complimented my slightly ginger hair. It was one of those dresses that looked fantastic. Needless to say, I was very pleased with it. That was until I saw the mother of the bride, who looked, as a lot of mothers of the bride do, almost as good as her daughter. Her dress was exactly the same shade of green as mine! It wasn’t the same dress but as everyone else’s dresses were so different, we might have well have been twins! Not the best wedding experience I have to say. One thing I found fascinating about the royal wedding was seeing the various head attire (hats is not the right word). There were quite a few that were quite fanciful and some that went a little over the line of ‘statement piece’ to ‘when they look back at the photo’s they will wonder what they were they thinking?!’. This is my salute to those wonderful ‘hats’ (a little scaled down as I actually want to wear it). I made it our of bit’s I had lying around. My favourite colour is yellow and I had these fake flowers lying around. 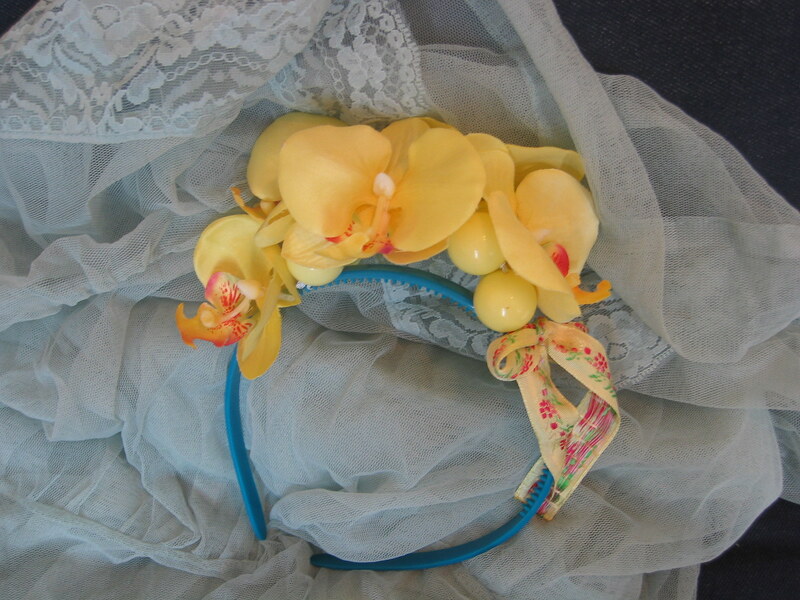 I also got given an old bracelet and wrapped around a bright blue hair band (yes I’m at it again) that provided a perfect base of the fake flowers to be glued to. I added extra support to the bracelet but threading wire through it and secured it into place. I then took my handy super glue and positioned the flowers so that they looked good from the front and the back. It was my own little flower arrangement! It still looked like it needed something else so I used a scrap of yellow ribbon, tied it into a bow and stuck it on. It looks quite good on! I’m going to wear it this Sunday. I’m going to my churches International day (a day when all the different nations in our church come in their nation clothes). We have a lot of people from all over the world in our church and on International day (which happens annually), and they always look amazing. I used to borrow my friends Nigeria clothes but this year I have decided to embrace my heritage (and my paleness!) 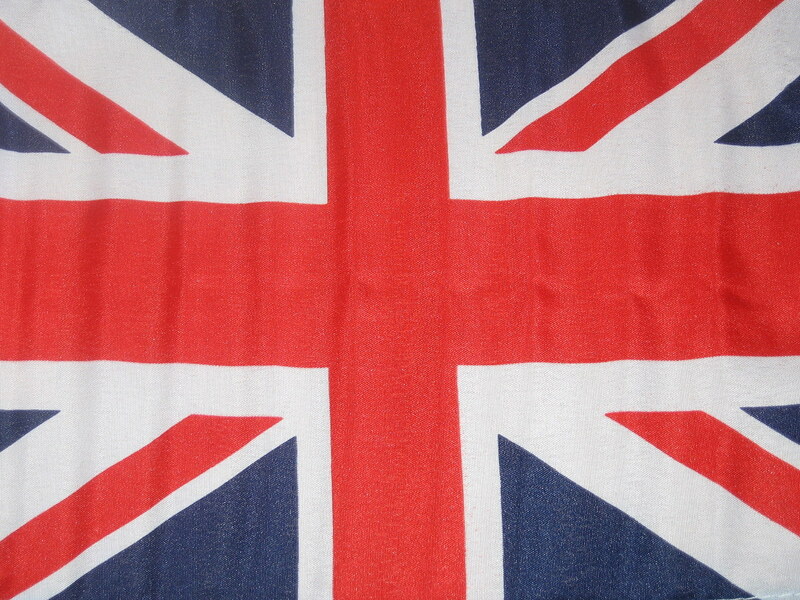 and make a dress from union jack material. I have a little confession to make, I have already made the dress but no one gets a sneaky peak until Sunday! All I will say is that my little yellow ‘hat’ goes really well with it. If I can take nice picture of it, I will up load it. Until then, I hope you feel inspired to make something beautiful.